Sunday, April 26, 2015 2:00 - 6:00 p.m. 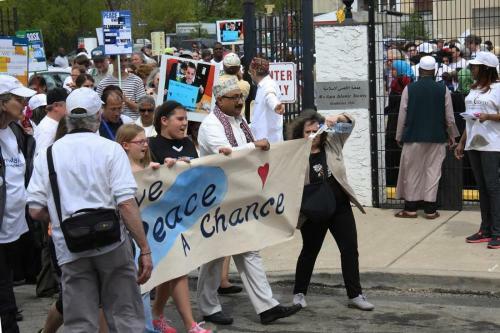 This year marks Philadelphia's 12th annual "walking dialogue towards peace and justice" among individuals of many faiths: Jews, Christians, Muslims, Buddhists, Hindus, Sikhs, Wiccans, Baha'i and others, as well as secular participants. Transport for non-walkers is available. As we share prayers, teachings, singing and fellowship, we affirm each other’s spiritual values. The theme of this year’s Peace Walk is Reclaiming the Earth, Repairing the World. The Walk will take place in the Kensington section of Philadelphia and include stops at Al Aqsa Islamic Center, The Village of Arts and Humanities and West Kensington Ministry. Among the speakers this year is Rabbi Arthur Waskow of The Shalom Center (and a member of Mishkan Shalom). Parking is available at the Al Aqsa Center. After a period of greeting, orientation and prayers, we will walk to the Village of Arts and Humanities for a brief stop, and from there to the West Kensington Ministry on Norris Square. Everyone is invited for food and fellowship at the conclusion of the walk at WKM. Buses will be available to transport walkers back to their cars. Download, post & share the program flyer with your lists! Learn more: Visit the Peace Walk website. For more information, contact Lance Laver, Peter Handler, Brenda Lazin, Mishkan Coordinators. -- People are encouraged to park and gather at Al Aqsa Islamic Center at 1:30 p.m., enter the men's and women's sections of the mosque, and be ready for the program to start at 2:00 p.m.
-- Please wear white -- at least a white shirt -- as a sign of unity. Multi-colored head coverings are encouraged. -- Please carry only peace-related (not political) signs. -- A bus will be available to transport anyone needing assistance and to take people back to Al Aqsa Mosque from West Kensington Ministry after the Walk. -- Medics will be available to treat anyone needing attention during the Walk. Contact a guide or usher if needed. -- Times listed in the program schedule are estimates and may vary based on the conditions of the day. ... to build bridges across the divides that separate us. ... to celebrate diversity and to learn from each other. ... to seek peace, in our streets, in our world, and our hearts. ... to leave our children and grandchildren a more sustainable world. ... to bear witness that the only way to lasting peace is through justice.